This week just flew by so fast. What is happening? Haha. There has been a lot of change that has happened too. First off, Wednesday morning Elder Cardwell and I got a call from the mission president. He said, “Elder Cardwell, pack your bags you're leaving tonight and being transferred to Hutchingson.” So that was a pretty big surprise! Apparently, a new Hmong speaking elder came in and since they have extra time learning the language in the MTC they get here mid-transfers. Because of that I guess things just got shuffled around a bit. 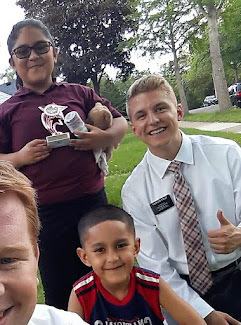 Entonces, mi compañero nuevo es Elder Nelson! He's such a stud. Although it's been a little difficult because we are both still learning the area, we are loving New Brighton! Wednesday was also our worldwide mission broadcast. We received some awesome training on how to better help our investigators repent and progress towards baptism. Also, there is more flexibility in the schedules according to the specific area. Since we are in the U.S. our schedule didn't change much, so nothing super exciting. We had a really exciting day at church on Sunday because a less active Hispanic couple, who we have been seeing for a long time and haven't been to church in about 5 month, came to church this week! We also had an investigator from the Shoreview area come to our ward. He's from El Salvador and wanted to meet more Spanish speaking people in the church, so we took him to our Spanish Sunday School class and he loved it! On a more sad note, our investigator who had a date set for baptism on Saturday dropped us on Wednesday. So, that was a big blow, but we still have our heads held high for the future! So, in our mission it is a tradition to go to the Mall of America at least once when a missionary is a few days from going home. One of the new Brighton sisters from Hong Kong is going home next week, so we all got to visit the Mall of America for P-Day today! It is just enormous! We had a blast. We also took a recent convert to the church named Walter, so fun! Miracle of the week: A really amazing experience from this week happened on a Tuesday night. We were on bikes this week and had an appointment with less active family way up in the northern part of our area, so it was a really long bike trek up there. Right before we left we got a text on the phone, but I just had an impression that I should check it later. We rode all the way up to the family's house and as we were walking up to the door I looked at the text and it was them. They told us they had something come up and couldn't meet! Elder Cardwell and I were like “Ahh man! we rode all the way here just to turn back around!” But then we had a thought to stop by and visit an Hispanic family who are members and lived close by. They let us in, and it turns out the mom was really sick and had been praying for us to come by! We were able to give her a healing blessing by the power of the priesthood. It was amazing to see the Lord directing us where we needed to be that night in order to answer her prayer! I know that our Heavenly Father answers every prayer. If we pray with real intent and with a sincere heart, we can receive answers and guidance through the Holy Spirit. I love this scripture in the Book of Mormon, Mormon 9:21 says "Behold, I say unto you that whoso believeth in Christ, doubting nothing, whatsoever he shall ask the Father in the name of Christ it shall be granted him." Likewise in the Bible, James 1:5-6, the scripture that started the ball rolling toward restoration, says "If any of you lack wisdom, let him ask of God, that giveth to all men liberally, and upbraideth not; and it shall be given him. But let him ask in faith, nothing wavering." Young, 14 year-old Joseph Smith read this verse and decided to act on the faith he had, and pray to know which church he should join. It was then when Heavenly Father and his son Jesus Christ appeared to him and he received the answer to join none of them. God then called Joseph Smith to be a prophet and once again establish the church of Jesus Christ and receive the proper power and authority of God called the priesthood. I think just the fact that the restoration of the fullness of the gospel was predicated on a single faith-filled prayer just shows us the magnitude and power that prayer can have in our lives! I also love the parallels of 'doubting nothing' and 'nothing wavering'. We must always pray with full energy of heart and with full faith that God is listening to us. I know he is. I know he loves us. He sent his son to atone for the sins of the world. This is His true and living church on the earth today. I know it's true!! I hope you all have a wonderful week back home, estoy muy agradecido por todo de ustedes! Dios Bendiga.